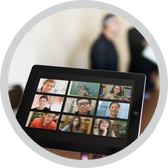 Simple, scalable and fully featured video Webinars for up to 10,000 attendees with Zoom Video Webinars. With excellent quality, reliability, scalability and affordability, Zoom Video Webinars helps you build personal connections, engagement and trust with your organisation, customers and audience. Zoom Webinars provides you with a customisable and branded webinar platform that is simple, intuitive and reliable for your events. Add integrated global telephone calling, customisable emails and registration forms and flexible registration management. Access multiple integration options for your CRM system. Integrate with Facebook Live and YouTube to reach your chosen audience. Zoom Webinars is a full featured, simple and intuitive solution for presenters and attendees from any device, including desktop, laptop, mobile, Zoom Rooms and H.323/SIP Video Conferencing systems. With one-click HD screen sharing, and up to 100 live video panelists that can share their content, video and audio, using Zoom for your webinars gives you unique and interactive features with a seamless experience everytime. Get in touch with VideoCentric to find out more about video webinar solutions from Zoom and other providers, to understand what works best for you.